Trichoderma is a filamentous fungus that is widely distributed in the soil, plant material, decaying vegetation, and wood. Hypocrea spp. are the teleomorph of some Trichoderma species. Although it is commonly considered as a contaminant, Trichoderma may cause infections in presence of certain predisposing factors. The genus Trichoderma has five species; Trichoderma harzianum, Trichoderma koningii, Trichoderma longibrachiatum, Trichoderma pseudokoningii, and Trichoderma viride. Morphological features of the conidia and phialides help in differentiation of these species from each other. Apart from these, two other species, Trichoderma asperelum and Trichoderma citrinoviride  have been proposed. However, their identity and clinical significance remain unconfirmed and doubtful . See the summary of teleomorphs and synonyms for the Trichoderma spp. Very few human cases due to Trichoderma have been identified. Trichoderma infections are opportunistic  and develop in immunocompromised patients, such as neutropenic cases and transplant recipients, as well as patients with chronic renal failure, chronic lung disease, or amyloidosis. Peritonitis , pulmonary, perihepatic, and disseminated infections  have so far been reported. Colonies of Trichoderma grow rapidly and mature in 5 days. At 25°C and on potato dextrose agar, the colonies are wooly and become compact in time. From the front, the color is white. As the conidia are formed, scattered blue-green or yellow-green patches become visible. These patches may sometimes form concentric rings. They are more readily visible on potato dextrose agar compared to Sabouraud dextrose agar. Reverse is pale, tan, or yellowish [531, 1295, 2144, 2202]. Septate hyaline hyphae, conidiophores, phialides, and conidia are observed. 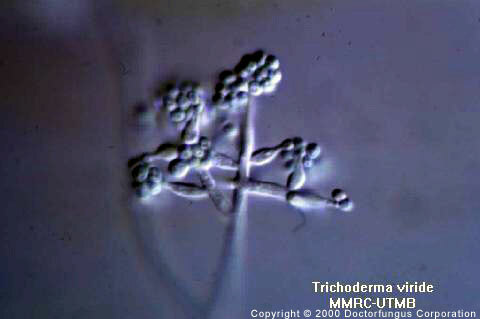 Trichoderma longibrachiatum and Trichoderma viride may also produce chlamydospores. Conidiophores are hyaline, branched, and may occasionally display a pyramidal arrangement. Phialides are hyaline, flask-shaped, and inflated at the base. They are attached to the conidiophores at right angles. The phialides may be solitary or arranged in clusters. Conidia (3 µm in diameter, average) are one-celled and round or ellipsoidal in shape. They are smooth- or rough-walled and grouped in sticky heads at the tips of the phialides. These clusters frequently get disrupted during routine slide preparation procedure for microscopic examination. The color of the conidia is mostly green [531, 1295, 2144, 2202]. Branching septate hyphae may be observed . See also our histopathology page. Very limited data are available. Amphotericin B  and itraconazole [684, 1924] MICs may be elevated. Voriconazole exerts (some) activity in vitro against isolates of Trichoderma longibrachiatum . Posaconazole , caspofungin , and anidulafungin  appear promising in vitro. For MICs of various antifungal drugs for Trichoderma spp., see our N/A(L):susceptibility database.